Monday January 30th 1922 Went up home in AM. Wrote to Hattie. Had a letter from Lydia with one enclosed from Martie. I read in afternoon and evening. Tuesday January 31st 1922 Did not get up till late. Read in afternoon and evening. I was up home a little while just before supper. a fine day. Wednesday February 1st 1922 Got up earlier today. was reading to pass the time. a very strong wind in afternoon. Ott & I both reading in the evening. Thursday February 2nd 1922 I read in forenoon. weather pleasanter. Fannie came home on afternoon train. Dr Smith over to change bandage on my arm. Ott had to go to town after supper. Fannie & I had a good visit. 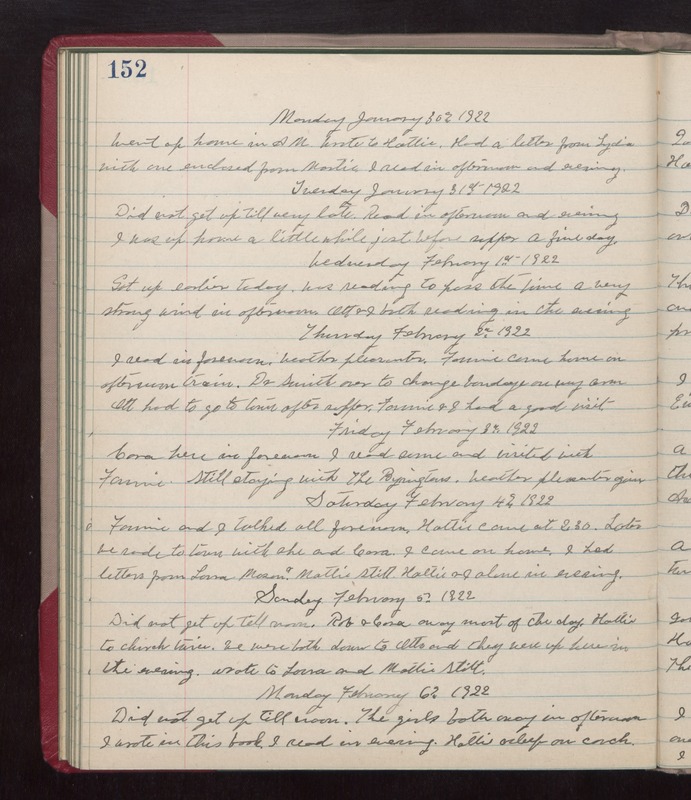 Friday February 3rd 1922 Cora here in forenoon. I read some and visited with Fannie. Still staying with the Byingtons. Weather pleasanter again. Saturday February 4th 1922 Fannie and I talked all forenoon. Hattie came at 2.30. Later we rode to town with she and Cora. I came on home. I had letters from Laura Mason & Mattie Stitt. Hattie & I alone in evening. Sunday February 5th 1922 Did not get up till noon. Rob & Cora away most of the day. Hattie to church twice. We were both down to Otts and They were up here in the evening. Wrote to Laura and Mattie Stitt. Monday February 6th 1922 Did not get up till noon. The girls both away in afternoon. I wrote in this book. I read in evening. Hattie asleep on couch.